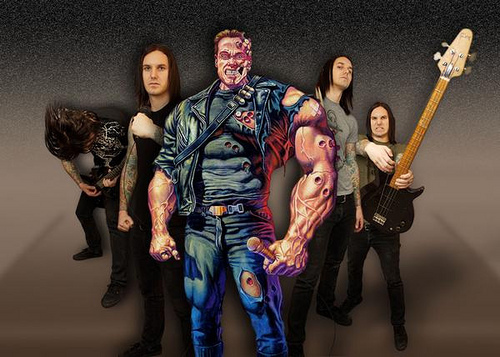 Months before Tim Lambesis‘ plans to have his wife killed would go public, Austrain Death Machine – a comedic metal side project created by Lambesis – launched a hugely successful Indiegogo campaign to fund the creation of the group’s third full-length album. The album was in production when Lambesis was initially arrested, but thanks to a group of people working behind the scenes it was able to be completed and prepped for a spring 2014 release. “[W]ith artists and other celebrities we require thorough vetting before entering into partnerships,” Sheryl Watkins, World Vision’s senior communications officer, tells Noisey in an email. Lambesis can still make donations to the organization under the radar, Watkins says, but she adds that, as of the album’s release, neither Lambesis nor the band had established an account with World Vision or any formal relationship with the charity. It’s likely we will see a response from the team behind Austrian Death Machine in the next couple days. If and/or when that happens you will be among the first to know. Follow UTG on Twitter for updates. Full disclosure: UTG was offered an interview with Tim Lambesis less than two weeks ago, but we were told we would not be allowed to ask about anything other than Triple Brutal. We thought about trying to make the best of things, but after discussing the opportunity as a staff felt it would not be fair to readers if we spoke with someone that high-profile and completely disregarded the black cloud of trouble looming overhead. We may review Triple Brutal, but we certainly won’t be discussing it with Tim anytime soon. I don’t understand why fans are hesitant to buy the new ADM CD. I mean plotting to kill your wife is bad but its also very metal!